Marysvale Utah is situated in the heart of the Paiute Trail and some of the best ATV and motorcycle trails in Utah and in the world . The ATV-friendly atmosphere of the people combined with the awesome beauty and diversity of the mountains, canyons, and valleys of this part of Utah make it one of the off-road capitals of the world. 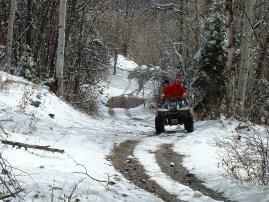 Following are some of our favorite ATV trails to ride in the area. For info on Paiute Trail weather and seasons click here. For a map of the general Paiute ATV Trail area click here. If you would like to ride some of these trails then come stay with us at Bullion Creekside Retreat and we’ll help you plan your Utah ATV trips or just give us a call or email inquiry and we’ll give you ’no-spin’ advice whether you stay with us or not. Paiute ATV Trail Network— The Paiute Trail system may be the largest and most diverse off-road trail systems in the world . The main Paiute trail is an endless loop through four Utah counties with thousands of side trails and inner loops. It winds through mostly BLM and National Forest lands and thus belongs to all of us. 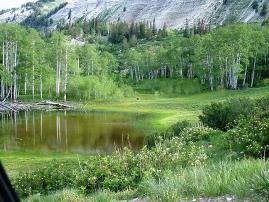 It boasts the highest jeep trail in Utah at 11000+ feet. It also winds through canyons and deserts with a wide diversity of plants and animals. It is directly accessible from Bullion Creekside Retreat by ATV. Bullion Canyon or Canyon of Gold Trail Area— This beautiful area is technically part of the Paiute Trail Network. It is considered by many to be the best part of the Paiute Trail. Stretching up into the high Tushar Mountains out of Marysvale, Utah it boasts old mining camps, the beautiful Bullion Falls, fishing, Mountain Goats and other animal viewing, and the beautiful fall colors of maple, oak, and aspen. The connecting cottonwood loop trail reaches about 11000 feet elevation. This ride is minutes from Bullion Creekside Retreat. Cottonwood Canyon ATV Loop— This is a great half-day loop out of Bullion Creekside Retreat. It is accessed via the beautiful Bullion Canyon or also known as Canyon of Gold. This road takes off just beyond the bridge in Bullion Canyon and climbs via many switchbacks through meadows and Fir and Aspen stands to over 11000 feet to climb over ‘horse heaven’. There is a side trail with a spectacular view of the Marysvale valley and old miners cabin perched on the edge of a 200 foot cliff. Another side trail gives a view of the upper Bullion wilderness. The sighting of the mountain goats are a real possibility from the high parts of this trail. Many wildflowers are available in season. The trail then drops off into secluded cottonwood canyon with the mysterious cabin perched out on the rocky outcropping. This road eventually crosses Highway 89 and allows one to loop around to Marysvale. Deer Creek ATV Trail— We have recommended this Paiute Trail 77 to many and it has never been a disappointment. This trail follows the old 19th century mining road up into the Kimberly mining district that has deteriorated to basically a two-track ATV trail. The bottom part winds through a spectacular deep canyon that makes you feel like you’re in a national park. It climbs in elevation from about 6000 feet to about 10,000 feet at the top. It goes through beautiful meadows and stands of Douglass Fir and Aspen. It crosses beautiful deer creek several times. The creek is small but fishable in places. This trail is not too far from Bullion Creekside Retreat via the Beaver Canyon Trail. South Monroe—Elbow Ranch Valley Desert Wildflower Ride— We especially recommend this ride around the end of May when the desert wildflowers are in bloom. It goes over a variety of desert and mid-elevation mountain terrain. It includes high desert sagebrush and forest that has plenty of wildlife including trophy elk, mule deer, and sage grouse areas. This loop is not far from Bullion Creekside Retreat. It is good for a half day ride but could be stretched to a day if one likes to try some of the side spur trails. There are some expert technical riding trails that can be taken off from this trail. This loop also travels through spectacular dry creek canyon with it its unique waterfall and interesting geologic formations. Barney Lake ATV Excursion— To start on this great excursion from Bullion Creekside Retreat, one crosses the desert valley and accesses the Monroe Mountain Range via spectacular Dry Creek Canyon. This beautiful climb switchbacks through spectacular rimrock and cliff country. There is a beautiful waterfall if one knows where to pull off the trail and look. 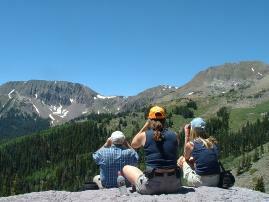 This trail tops out on the Monroe Mountain plateau which boasts beautiful meadows and aspen stands. There are possibilities of seeing some of the largest bull elk in Utah in this area. September can be a symphony of the many bulls that are trying to woo a harem. The highlight of this section is beautiful Barney lake and Manning Meadow Reservoir which have large native Brook Trout and spectacular forest and meadow country. There some expert trails in this area for those who want some adrenaline adventure. Beaver Canyon ATV Loop— We consider this loop out of Bullion Creekside Retreat to be the perhaps the best part of the Paiute Trail and a must-see for all who want to see the best that the area has to offer. The road is fairly good but dangerous for the careless as it is a very deep canyon off the sides of the road in places. The road (Paiute Trail 01) goes over the pass which is boasted as the highest road in Utah at about 11400 feet or so. It goes through the Tushar Caldera which is the center of an ancient volcano. There is a beautiful little waterfall in the caldera. The higher-than-timberline trail passes by the flank of of Mount Belknap and Mount Delano which are both over 12000 feet high and some of the highest peaks in Utah outside of the Uintas. Upper Bullion Canyon has some of the best wildflower meadows to be seen as well as good prospects for viewing Rocky Mountain goats and trophy deer and elk in the high country. From the top one can come back down Beaver Creek or continue the loop through spectacular forest and mountain country and come back through Circleville or Junction to Marysvale via the valley roads. If one takes the full loop we recommend a little extra gas be taken. 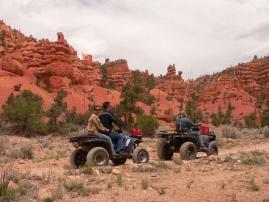 Casto ATV Trail— This two-track ATV trail winds up and through the famous pink hoodoo formations very similar to the Bryce Canyon scenery. We enjoy riding up this trail and connecting to the Limekiln Canyon trail. One then comes down Limekiln canyon and loops around to the beginning trailhead of Casto Canyon. The upper section of this loop has a beautiful stand of Bristlecone Pines which are the oldest known living species on the planet. They are known to be as old as 4000 years. Fremont ATV Trail— The Fremont trail is a fifty mile stretch made of existing roads between Circleville Utah and Tropic Reservoir near Bryce Canyon. At Circleville, the trail connects to the Paiute Trail. One of our favorite side loops on this trail is the Casto Trail –Limekiln Canyon loop. Coral Pink Sand Dunes— This state park is in day trip trailering proximity (about 2 hours) from the heart of the Paiute Trail. It makes an interesting diversion to try a different kind of ATV ride from the Paiute trail riding. It boasts beautiful pinkish sand dunes made from the Navajo sandstone formations of that part of southern Utah. It has Ponderosa Pine forests interlaced into the dunes. There are a few steep dunes for the power ATV enthusiasts as well as many intermediate and beginner sand trails. There is a minimal day use fee to ride in the dunes. A safety flag is required on all ATVs in the Park. Disclaimer— ATV riding in general and travel in the Utah backcountry is dangerous by nature and could result in property damage, injury or death. If you ride these trails, you acknowledge this danger and assume full responsibility. You are the final judge as to whether a trail is safe on any given day and whether your driving skills and equipment capabilities are adequate for a safe trip on these trails. 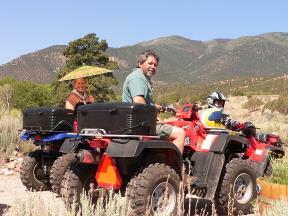 Guests Jim, Jackie, and Jacob leaving Bullion Creekside Retreat for the famous surrounding ATV trails.